Is that a hummingbird in Anchorage?! Well, it looked and acted like one, but its coloration and the antenna (visible in the right photo) give it away as an imposter: a hummingbird moth. 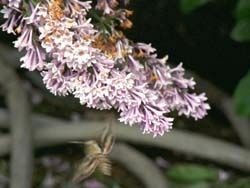 It fooled me, and hummingbird moths have fooled lots of other folks, too. A visitor to this page exposed the imposter. Spring comes late to Anchorage. 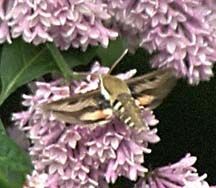 Early spring flowers such as crocuses and tulips begin appearing in carefully tended beds in late April and lilacs, such as the one this hummingbird moth found, bloom in early June. Flowers are plentiful in Anchorage, whose boosters refer to it during the summer as "The City of Flowers." The multitudes of hanging flower baskets that appear as soon as the weather turns mild would as easily justify the statement: "City of Hanging Gardens." However, hummingbirds are rare. This is the only one I've seen in more than 20 years here. Poppies and peonies (below) flourish in Anchorage's mild summer climate but roses need coddling and only hardy wild roses can withstand the deep freezes of Anchorage's long winter.